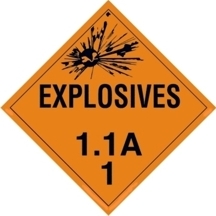 Drive Legally with Magnetic DOT Explosives Placards. Use magnetic blanks on metal substrates and use with permanent and removable adhesive placards. D.O.T. Placards are 10 3/4" x 10 3/4" and meet new HM-181 regulations. Our magnetic placard is made of 30-mil material, compared to 20-mil by most other companies. Please see below material classification. The placards were what we needed. We will be ordering in the future.